Soft Cover, 317 pages, 5.5 x 8.5. In the history of the American Homebrewers Association's National Homebrew Competition, few brewers have succeeded like Jamil Zainasheff. 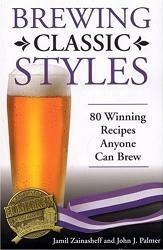 From his first gold medal in 2002 through his second Ninkasi award (for best all around brewer) in 2007, he has accumulated a trophy case full of NHC medals -- all with recipes contained inside this book.